Tropical Storm Daniel formed in the eastern Pacific Ocean Thursday morning south of California, the National Hurricane Center in Miami said. As of 5 p.m. Eastern time on Thursday, Daniel had maximum sustained winds of 60 mph and was moving west at 13 mph. 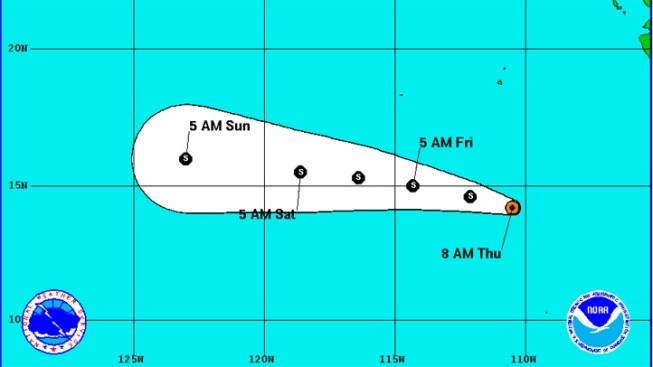 The storm is expected to continue its westward movement and become a hurricane on Friday. Daniel became a storm over the open water and is currently 615 miles south of the southern tip of Baja, California. There are no coastal watches or warnings currently in effect. Stay with NBCMiami.com for updates. Click here for 2012 hurricane season coverage.